The volcanic activity of the Canary Islands, with fourteen historic eruptions in the last 500 years, makes it the only area in Spain with a high potential for exploiting high-enthalpy geothermal resources, which are capable of producing energy thanks to temperatures of over two hundred degrees generated beneath the Earth’s surface. A team from the Department of Earth and Ocean Dynamics of the Faculty of Earth Sciences of the University of Barcelona participates in the TERMOVOLCAN project, which aims to promote the development of this type of renewable and continuous energy. The objective is to design and develop innovative geophysical and geochemical methodologies to improve the exploration of geothermal resources in the islands of Tenerife, Gran Canaria, and La Palma. This initiative, which will be carried out until 2021 and has a total budget of over €1,600,000, falls under the Retos Colaboración call of the Spanish Ministry of Science and Innovation and Universities, whose objective is to fund collaborative projects involving companies and research organizations. In addition to the FBG of the University of Barcelona, the project consortium also includes the Technological and Renewable Energy Institute (ITER), the Volcanological Institute of the Canary Islands (INVOLCAN), the Spanish Geological and Mining Institute (IGME) and the Tenerife Island Energy Agency. “The purpose of TERMOVOLCAN is to make a detailed study of the Canary Islands in order to identify the areas with the greatest geothermal potential. To this end, a series of leading innovations in the fields of geophysics and geochemistry will be used and developed to facilitate the location of geothermal deposits that will later enable the development of geothermal energy on the islands”, explains Juan Ledo, a professor of the Department of Earth and Ocean Dynamics and the leader of the UB team working on the project. Some of the geological characteristics of the Canary Islands make it difficult to search for geothermal deposits, as surface manifestations such as thermal springs, fumaroles and abnormal gas or heat emissions are not as evident as in other active volcanic systems. 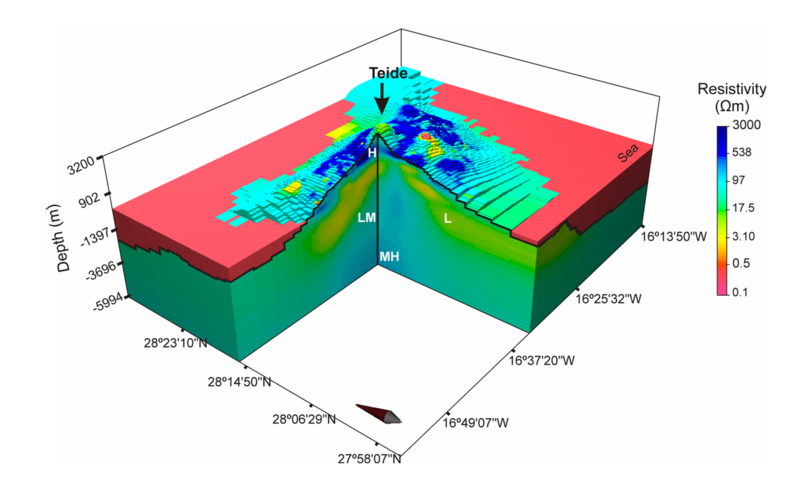 In order to study the soil and subsoil under these conditions, TERMOVOLCAN will use innovative geochemical techniques to detect areas of the surface with increased permeability to the ascent of fluids of deep origin, such as the analysis of the isotopic composition of helium, a tool that helps to locate deep heat sources. Thermal satellite images will also be analysed and geophysical methods such as magnetotellurics (MT) —in which the members of the UB team are experts— will be used. This is a technique that provides images of the structure of the subsoil at a greater depth than that which can be achieved by means of conventional electrical or electromagnetic techniques. A 3D model of each island will be produced combining this geochemical, geophysical, and geological information, which will be used to plan the first deep surveys. These surveys will reveal different parameters such as temperature, pressure, and enthalpy of geothermal fluids, which will finally determine the possibilities of exploiting the Canary Islands for electrical or thermal purposes.